Elephant Hill trailhead offers an outstanding assortment of trails in some of the most beautiful, approachable and more remote areas in Canyonlands National Park. Off the beaten trail, well over an hour from Moab in the Needle District, 3 miles off a paved road, this area is not to be missed. There are 60 miles worth of trails to choose from at the park. There are sixty miles of interconnecting trails in the Needles area of Canyonlands National Park - many loops that can be added to plan a magical trip. It is hard to imagine a lovelier place to spend one night or many. There are a variety of campsites accessible from the Elephant Hill Trailhead or the Squaw Flats Trailhead at the Squaw Flats Campground. Your trip may be decided by campsite availability. These Trailheads are over 80 miles from Moab, but worth the drive. There are more options in this area than could be dreamed up and it would be hard to go wrong backpacking in this area. Once into the area, there are over 60 miles of interconnected trails to explore. Sites to not miss in the areas starting from Elephant Hill trailhead are: Chestler Park, Druid Arch, and The Joint Trail. Chestler Park is an area that epitomizes a deep National Park experience. Beautiful and peaceful, a sunset watching the changing light on the imagination stirring rock sculptures and deep desert grasses could fill a mind with a year of memories. There are 5 campsites in this area. The Joint Trail is not to be missed. The Joint Trail is magical, the trail works its way through a narrowing canyon until you ascend a magical staircase in a narrow slot into a cave filled with Cairns that the rangers periodically knock down. It is chilly and refreshing inside. The trail continues through cracks within massive boulders that will make you feel like an ant in moving through the space between handful size boulders. There are side cracks to explore. This is one of the most special experiences imaginable. Take the time to get here, it’s special. Druid Arch is reminiscent of a blocky version of Delicate Arch in Arches National Park, a Utah icon. The views from this trail are, according to the Park, “one of the most spectacular views in the Park.” The last ¼ mile is steep and includes scrambling and a ladder. Seasonally, there is some water near by and there are 3 camping sites available. Backpacking in this area is what dreams are made of, but only for the strong and the experienced. There is no water available in this area. The Park recommends a gallon of water a day for hiking, plan on bringing more for camping. With many options of campsites, routes may be determined by availability of campsites. Go to Canyonlands National Park’s website for availability and rules for camping. From Moab, drive south 40 miles to the junction of 211. Take a right at the submarine shaped rock on your left. From here, it is 35 miles to Canyonlands National Park. Be careful of mule deer, there can be hundreds if not thousands of them over periods of miles covering the road and area around the road. 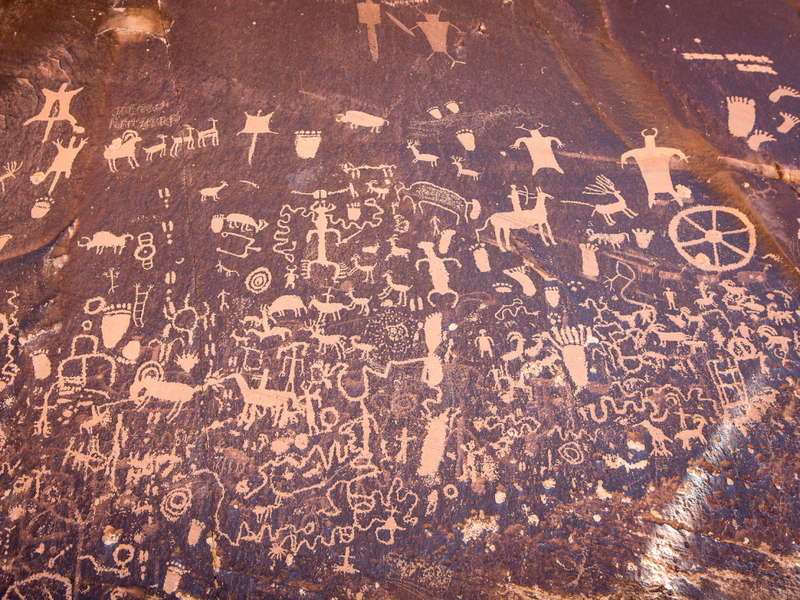 Pass Newspaper Rock, an impressive panel of Petroglyphs dating back 1500 years, go through Indian Creek Recreation Area and into the Park. From the Visitors Center drive 3 miles towards the Big Spring Canyon Overlook. Take a left following a sign for Elephant Hill and a right, again following signs towards Elephant Hill. The next 2.7 miles are on a dirt road with steep drop offs and blind curves, be careful. The trailhead for the hiking trails is not the 4x4 trail at the end of the road; it is to your right within the parking area. Make sure the sign your hike starts on is the hiking trail, not the 4x4 trail. There is parking, but it can fill up. There is no fee to park. Entrance to the park is $10 for a vehicle and is valid for 7 days, Motorcycles are $5 each and entrance is valid for 7 days. Per person with no vehicle (bicycle) or parties of one are $5 and is valid for 7 days. There is also an annual parks pass available for $25 that gives a years entrance to all National Parks. Check the Park’s website as some days of the year (such as Martin Luther King Jr. Day and Veteran’s Day) are free. Dogs are not allowed on this trail and cannot be left in the car at the trailhead.